From everything I’m reading these days, it seems that Americans just have too much stuff. A huge number of garages can’t fit cars because they are used for storage. People are even moving to larger homes to accommodate their growing piles of stuff. Which is crazy! All the excess is NOT improving the quality of your life and maybe you can live without a good part of it. When I stage a home to sell, I regularly have the client put about a third to a half of their belongings into storage. 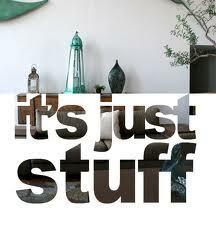 Too much stuff is visually unappealing, adds to the feeling of clutter, and makes rooms feel smaller. Even if you’re not moving, it’s hard to find the time to sort, organize and manage lots of possessions. Think about the time spent moving piles around trying to clean, the time spent looking for something to wear, and time spent looking for “lost” things. It adds stress to your life! So in 2013, make it a priority to not buy anything new unless it is really something special, and donate/sell the things you don’t need anymore.